Think Microsoft Surface is the only one that gets to have fun with a keyboard hidden in the tablet's cover? Hell naw, quoth Archos. The Gen10 XS Tablet is bringing some old-style clickity-clack to the tablet game. If only they'd made it, you know, work. It's a 10.1 inch Android tablet that has a keyboard built in to its magnetically detachable case. Someone who wants to write a lot with their tablet but hates typing on touchscreens. The tablet comes in two pieces. The tablet itself is very thin (0.31 inches) and weighs only 21 ounces, making it slightly lighter and thinner than the current generation iPad. The "coverboard" is only 0.2 inches thick. Both have stainless steel back panels which they use for strength. To separate the cover from the tablet, you twist it to break the magnetic connection. If you want to use it in keyboard/stand mode, you flip up the magnetic kickstand in the keyboard, and the magnets guide the tablet into place, where an 8-pin dock joins the two. The best part is the idea of the magnetically attachable keyboard cover. I mean, cool idea, right? The worst part is the execution of they keyboard cover. They chiclet keys are tiny and the keyboard is extremely compressed. If you move the unit, you have to hold onto both the tablet and the keyboard, or they'll separate and one will fall. What's worse: if you just want to use it as a tablet, you've got nowhere to put the cover since it can't simply attach to the back and stay put. Most tablets have a hard metal ring around the outside, then a plastic bezel and back. Archos does the inverse here, with a plastic ring on the outside and a stainless steel bezel and back. Up is down. Red is blue. The keyboard has Android shortcuts: Home, Search, App Switcher, Notification Panel, Brightness Control, Play/Pause, Volume, etc. It's the best thing going for it. It means you don't have to take your hands off it as much. The 1280x800 screen is extremely forgettable. Bland colors, not so bright, and even less sharp. The dual-core OMAP 4470 is simply less powerful than its quad-core competitors that you'll find in powered up tablets like the Asus Transformer Prime. Apps take forever to load and a lot of games struggle. Surprisingly though, the new PowerVR SGX544 GPU actually out performed the Tegra 3 in graphics benchmarks. The stainless steel may be stain proof, but it sure ain't scratch-proof. After just a couple gentle rides in my backpack, the thing looks beat the hell up. It's billed as a media-centric device, but it only has one speaker that's all the way over on the right, making you feel like you're listening to music with one headphone burnt out. Oh, and it's one of the worst-sounded speakers we've heard on a tablet. Double-whammy. Ports! It's got 'em. Micro SD, micro USB, mini HDMI, and a headphone jack. No rear-facing camera. Which you shouldn't be using anyway. Archos will also be launching an 8-inch Gen80 XS and a 9.7-inch Gen97 in November. If the 9.7-inches caught your eye and you're wondering why they hell they'd market a product that is only 0.4 inches smaller than the Gen10, it's because the 9.7 will have a 4.3 ratio. In other words, its screen will have the same dimensions as the iPad. There is currently a bug when you use Gmail with the keyboard. Hitting backspace is like a reverse tab. Archos and Google are aware of the issue and are working on it. They keyboard did perform just find with the included Office Suite Pro, which generally works quite well. Battery life was disappointing compared to the Nexus 7, the Transformer Prime, and the Galaxy Note 10.1. It usually came in over six hours during your standard mix of gaming, browsing, and emailing. Most top tier tablets can last closer to 10, but nearly everyone squeaks out eight. Archos has promised an update to Jelly Bean (Android 4.1) before 2012 is over. No. For $400 you could get two Nexus 7s and you'll have a much, much better time. Even if you really, really want a keyboard, this integrated solution is just cumbersome and awkward. You'd be better off getting a tablet that performs well and buying a Bluetooth keyboard to go with it. 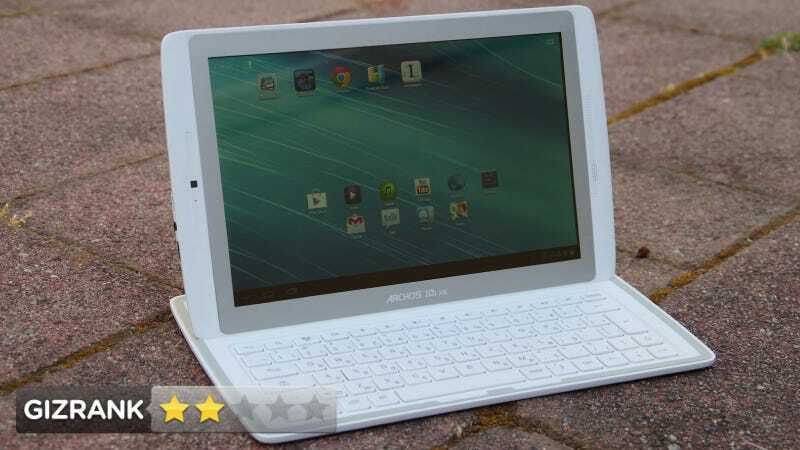 Good for Archos for sticking its neck out and trying something different, but this just falls down in the execution. The Gen10 will be available mid-Sept for Europe, but not until November in North America.